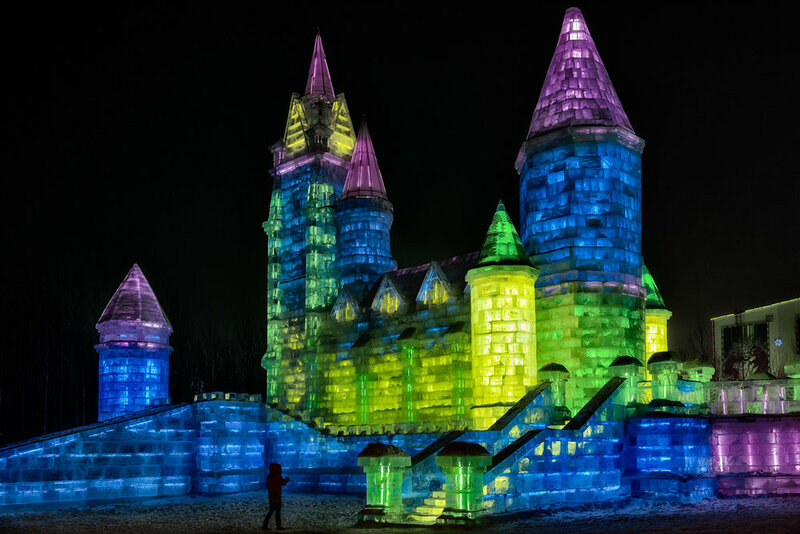 A magical and somewhat kitsch castle, made of ice and illuminated at night, at IceWorld in Harbin, China. There's no denying it, ice is what you'll see at the Harbin Ice Festival just outside the city of Harbin in far northeastern China. I spent a fun 4 hours there and managed to cover most of what was on offer. Huge structures, some resembling important or significant buildings from around the world, artificially lit in all manner of colors make this a fantastic place for photography. Disney on ice is one way of describing it. I wasn't bothered by the low temperatures, having dressed appropriately, except when my face was exposed to the bitting cold. I had bought a balaclava the day before which, while it scared one or two local girls when I approached them for a photograph, did allow me to work the entire evening outdoors in relative comfort. Despite what appeared to be an abundance of artificial light a relatively high ISO (e.g., ISO 800) was required for photographing handheld. Despite the crowds there was sufficient space for me to move unencumbered and, where required, to employ the use of a tripod. Actually it's a pretty surreal experience. And, of course, its very cold. As the Harbin Ice Festival is on the outskirts of town it's said to be several degrees colder than what you'd experience within the city of Harbin. So, at around -30C you'd want to make sure you have a fresh and fully charged battery in your camera and at least one spare battery, kept as warm as possible, within an inner pocket of your parka. It's a long way to come only to run out of battery power. My Canon camera and lens coped well with the conditions, although I had to wipe off the ice, which formed on the back of the camera, about every 10 minutes. To help prolong battery life I wrapped the bottom and right hand side of the camera in a fleece beanie. I was able to use the camera pretty much unhindered and got through the whole 4-hour photography session without having to change the battery. The above image features one of the less grand structures at the Harbin Ice Festival. The castle had a fairytale-like appearance but required patience to photograph due to the crowds that would walk right in front of me while I was trying to make a picture. In the end I waited until there was a single person in front of the castle. As well as adding a sense of scale to the scene I feel the human form, in silhouette, adds a sense of mystery and narrative to the image. Is our lone traveler entering a fairytale castle or, Minas Morgul, the Witch Kings lair? Now there's a question worth pondering. I’ve processed the photo a little dark so as to enhance the brooding mood I felt in this quite isolated area of the Ice World outdoor complex. Everywhere else it’s a much happier, upbeat place. But, on the edges of light, lies darkness waiting to creep down, like a thief in the night. This interplay between fact and truth is, to my mind, where the magic of photography exists. You can make great, straight documentary photos of the world around you. But you can also take those same facts and re-mould them to build your very own, unique truth. And of course your photos can then be reinterpreted by your audience, based upon their own background, knowledge, mood and past experiences. I think that’s the direction this photo’s going. My approach is to create it, make it as well as you can and then put it out into the world and see what happens. But of course, it all starts with the act of creation, which is what artists do.